Although our blog hasn’t quite caught up with us, we left Australia more than 10 days ago and have been traveling around the south island of New Zealand before we head to Auckland for a family wedding! 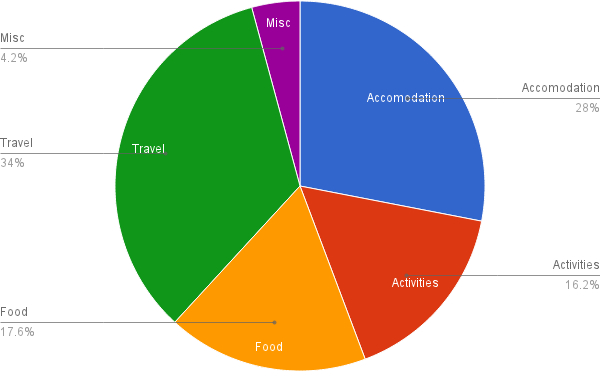 But in the meantime, I’ve finalized all my expenses for Australia and wanted to share my results. My spreadsheet keeps improving, and I’ve started to incorporate daily exchange rates via my credit card statement so that the cost in USD is as accurate as possible. There are some incorrect conversions when I pay with cash because the exchange rate used would have been the one on the day I withdrew it, but the differences are fairly minimal (< 1%). The cost breakdown below is solely costs incurred while in Australia and doesn’t cover any international costs (international flights, insurance, etc), but does cover domestic travel including flights. This is probably the best way to estimate our day-to-day expenses while in country. Accommodation, obviously, covers where we sleep each night. Food is everything we eat or drink — water, beer, dinner, lunch, snacks, etc. Travel is domestic travel only. So this covers bus trips, train rides, domestic flights, taxis, ferries, anything in country. Activities is the things we do for fun/entertainment. This is park entry fees, museum fees, theater tickets, etc. Mis. is a catch-all category that includes things like shampoo, laundry, gear replacement (although I will specify any major costs), souvenirs, gifts and medical expenses (again, I’ll specify anything major). I think the most misleading part of this analysis is the “Activities” category. There were some things we did — like our trip to Daintree — that were package deals including our transportation, park entry and accommodation. Also, we traveled by train at one point which might fall into the activity or travel category on it’s own, but since it was an overnight train it was also our accommodation. All of these I included in the “Activities” category for simplicity. Australia was a shockingly expensive country for us. I had done quite a bit of reading about the country beforehand and knew to expect high prices, but the small things were what surprised us the most. Items like coffee will surprise most Americans in terms of expense. The coffee system here is very different and trying to order a brewed black coffee in a restaurant or cafe is near impossible. The closest thing to it is a “long black.” This is a double-shot of brewed espresso poured into hot water to the strength of black coffee. The cheapest price for this odd concoction is around AU$4. We did, however, discover that 7-11’s throughout the country sell cappuccino and espresso for $1. (They were apparently running a summer special while we were there). This saved us quite a bit of money during the month we were there. Aside from coffee, food was generally very expensive, and it would have been impossible for us to eat in restaurants every day. As a result, we got very good at shopping for groceries and self-catered many meals. While staying in hotels without kitchen facilities, the “meals” were limited to items like toast or cold leftovers. But when we had a kitchen at our disposal in hostels and backpacker lodges, we were able to make meals as we would at home. Australia gave us access to ingredients we otherwise would be hard-pressed to find, like kangaroo! This made for some interesting kitchen adventures (kangaroo burgers!) and some surprisingly tasty meals. Also, we were able to economize further by shopping at local markets when available. Often these markets offer far better prices than supermarkets for items like produce. And if you wait until closing time at a market, you can sometimes clinch excellent deals ($1 for a kilo of strawberries was the best we did), but you have to be willing to take what you can get. The part of our budget that ballooned out of control was our travel expenses, making up more than a third of our total costs for the country. With only a month to spare, we had to hoof it to see everything we wanted, and as a result we flew to many locations. We saved some money by using the airpass offered by Virgin Australia to international travelers, but even at those reduced rates the cost would be outside of most backpacker’s budgets. Additionally, we completely underestimated the scale of the country and distance between cities, so having much of our travel booked in advance left us scrambling to make our connections (plane, train, etc) on time in many instances. We rented several cars during our trip, which provided a more personal experience but was quite expensive with Aussie gas at AU$1.40/liter (much more in remote areas). Slower travel is generally cheaper, but we paid up to see more. Other than travel, we came in under or at budget for our other expenses. We beat our accommodation expectation by $12/day and our food expectation by about $5/day. This helped to defray the extra travel costs and the costs of medical care to handle our unexpected illnesses. Our spending on Activities was high, but we expected this and we were able to check some things (Great Barrier Reef, Uluru) off our bucket lists. Overall we spent about $1,200 more (about $40/day) than we were anticipating, but I am quite happy with how well we were able to economize when it was possible. We have been saying to each other, however, that when recommending Australia to someone, we would tell them to see less and travel more slowly. We thought the most appealing form of travel would be to hire (or even buy) a camper van and travel up the east coast of Australia staying at camper parks along the way. We wouldn’t have seen nearly as much, but our trip would have been a lot more relaxed and probably considerably cheaper! Australia was certainly a highlight of our world trip, and while we did learn to navigate the high price environment, the initial sticker shock was quite surprising. I think this caused us to scrimp when we shouldn’t have. For instance, I wish we had gone out for a couple more nice meals while in Sydney and Melbourne and been less hesitant to spend money on souvenirs for ourselves. Any budget travelers heading to Oz would be wise to remember the old adage: lay out everything you plan on taking with you, then take half as much stuff and twice as much money. Thanks for this information! It will be very useful for when we plan on visiting Australia next year. We’re very excited to have a trip like yours. Anyway, we’ve enjoyed your blog over the past several weeks so keep up the good work. Safe travels! Good to hear from you, Mark! We’re looking forward to reading about your adventures with Joann, too! Budgeting is definitely the hardest thing to do! It’s difficult to know whether you’re spending too much or too little sometimes. Rooms were surprisingly expensive in big cities (AU$100+ for a double with shared bathroom in Sydney) and surprisingly cheap outside of them (AU$65 for a double ensuite with AC while driving along the great ocean road). Also in some instances a dorm room made sense, while in others it was only five extra dollars to have a private room. Although we generally paid up for private rooms unless it was outrageously expensive. I’ll keep trying to post my country spending in this format for each country we go to. I have a more detailed spreadsheet on Google Drive too that I may share soon once I clean it up a little. I also want to create a page dedicated to money that ill keep updated with this info and other money saving tricks we’re learning. Sheesh! I’ll try not to complain about coffee prices at Starbucks in the US anymore.